Update – See my latest post – Revisiting Aam ka Panna/ Raw Mango Cooler through the lens for the same recipe in a different look! Another recipe from my mother’s repertoire after Vegetable Loaf. There is nothing better to make one forget the sizzling hot Sun, warm winds & power cuts of summer in northern part of India than a glass cool of Aam ka Panna. As you can see I became lazy to click snaps and did an even sorrier job of clicking than I usually do. But as they all say in blogosphere, don’t go on the snap, but enjoy the drink! 1. Peel & de-seed mango. Clean mint leaves. Boil mango pulp & mint leaves together. Allow the mix to cool. Grind it into a coarse puree. 2. In a big vessel, add puree, water and sugar. Boil on high for 5-6 mins. Now add black salt as per taste. If required, add sea salt. Boil for another minute and then turn off flame. Add black pepper and roasted cumin seeds. Mix well and allow the mixture to cool. 3. Once cool, store in air tight container. When serving add more water depending upon required consistency. 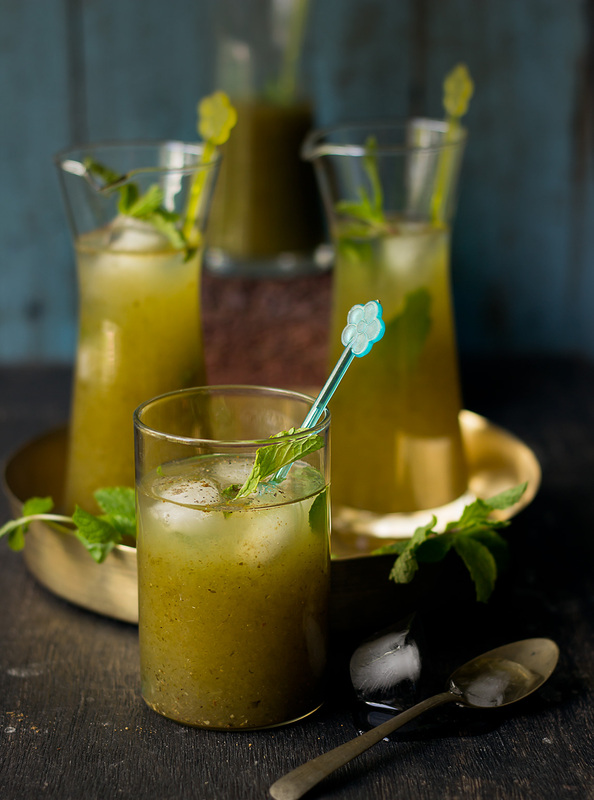 Serve chilled and garnish with fresh mint leaf. My mother’s recipe from the repertoire of family recipe. You can squeeze a bit of lemon at the time of serving if you feel the panna less tangy.